Richardson, Holder To Address Lawyer Group. Just days after the news that the U.S. Attorney won't be prosecuting Gov. Bill Richardson or other members of his administration, the Hispanic National Bar Association announced Monday that Richardson and Attorney General Eric Holder will be appearing at the HNBA convention. Richardson will appear at a Thursday morning session to participate in a discussion on "the independence and effectiveness of our Third Branch." I'm not sure when Holder is going to speak. The convention starts Wednesday and ends Sunday. My story on the effect of the U.S. Justice Department's decision not to prosecute Gov. Bill Richardson in the alleged CDR pay-to-play scheme can be found HERE. Basically most the people I talked to Thursday believe Richardson's political career and reputation will be revived and there could be some kind of position in the Obama administration ahead for him -- though probably not right away. In another development, The New York Times reported about a letter U.S. Attorney Greg Fouratt sent to witnesses in the grand jury investigation of the CDR matter. Mr. Richardson’s aides have long maintained that the acting United States attorney, Gregory J. Fouratt, a Republican, went after Mr. Richardson for political reasons, effectively sabotaging his chance to serve in the cabinet. Mr. Fouratt has denied that. After initially declining comment on the news that the Justice Department won't indict Gov. Bill Richardson on charges related to the CDR investigation, the governor's office just issued this news release. “While the U.S. Attorney’s Office has not notified Gov. Richardson about the completion of its investigation, it appears that no action will be taken as a result of the year-long inquiry,” Deputy Chief of Staff Gilbert Gallegos said. “Gov. Richardson has known all along that neither he nor any staff members committed any transgressions during their successful fundraising back in 2004. The U.S. Attorney’s thorough and lengthy investigation has apparently determined the same thing – that no indiscretions occurred. Val Kilmer tells KOB he's not running for governor. The Associated Press says "a person familiar with the investigation" of Gov. Bill Richardson officials and a California investment company called CDR says neither Richardson nor his top aides will be prosecuted on any charges having to do with an alleged pay-to-play scheme. The CDR investigation sank Richardson's nomination to be President Obama's secretary of Commerce and sandbagged Lt. Gov. Diane Denish' expect ascent to the governor's office. Roundhouse Roundup: Did Teddy Really Win It For Bill? Most were predictable. But the statement of Gov. Bill Richardson — who is on a trade mission in Cuba this week — had one line that caught my eye. I researched that 1982 race a couple of years ago for a story I wrote back when Richardson was running for president. And I don’t remember Kennedy being a major factor. For those not around that year, Anaya was the Democratic candidate for governor while Bingaman was the Democrat running against incumbent Republican U.S. Sen. Harrison Schmitt. It was a good year for Democrats in the state. Anaya and Bingaman both won, as did the 34-year-old Richardson in the newly created 3rd Congressional District. He got about 64 percent of the vote that year. But was it Kennedy who turned the tide for Richardson? The truth is, Richardson would have beaten Republican Marjorie Bell Chambers in the heavily Democratic district with or without Ted Kennedy. Basically Richardson won the seat when he won the Democratic primary that June. Indeed, it was a hard-fought and heated primary in which Richardson defeated Lt. Gov. Roberto Mondragon, political newcomer Tom Udall and a state judge named George Perez. 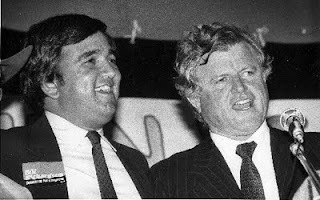 Checking the book: If Kennedy had anything to do with winning the 1982 Democratic primary, Richardson said nothing about it in his autobiography. 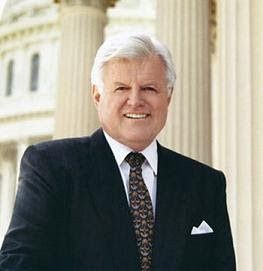 In fact, assuming the index is correct, there are only two mentions of Ted Kennedy in Between Worlds. However, just 49 pages later, Richardson talks about his first run for office in 1980 when he challenged incumbent Republican Congressman Manuel Lújan. I assume in that first reference the governor actually was recalling the 1982 election, when Kennedy did campaign for him. Memorial for Teddy: The state Democratic Party has planned a candlelight vigil for Kennedy at 8 p.m. today at Civic Plaza in downtown Albuquerque. Those attending are asked to bring their own candles. Please check out my story in today's New Mexican on what Sen. Ted Kennedy and his family mean to many Northern New Mexico Democrats. CLICK HERE. The only time I ever met Sen. Ted Kennedy was last year when he came to Santa Fe Community College in late January to campaign for Barack Obama in the New Mexico Democratic Caucus. After a speech we sat down for a brief talk -- mainly about old-time New Mexico poltiicos. I couldn't find it on the New Mexican's Web site, so I dug and it to post here. About 300 people crammed into the Jemez Room at Santa Fe Community College on Thursday to hear U.S. Sen. Edward Kennedy give a rousing speech on behalf of U.S. Sen. Barack Obama, who is competing in next week's Democratic presidential caucus. Kennedy's talk frequently was interrupted by applause, several standing ovations and, at one point, a hearty shout of "Viva Kennedy" from former Lt. Gov. Roberto Mondragon. Immediately before his speech, as he walked into the room, Kennedy, D-Mass., immediately recognized former Gov. Jerry Apodaca, who was sitting in the front row. "Jerry, how are you?" he said as he went to shake his hand. Earlier this week, Apodaca said he had decided to support Obama only after seeing Kennedy's endorsement. Obama supporters hope there are a lot more people like Apodaca in a state in which many see the Hispanic vote leaning toward Sen. Hillary Clinton. They hope shouts of "Viva Kennedy" turn into shouts of "Viva Obama." Ever since the days when Kennedy's brother John F. Kennedy became the first Catholic president, the family has been revered in many parts of the state, especially among Hispanics of Northern New Mexico. U.S. Sen. Dennis Chavez playing cards with a group of friends in some little house in some Northern New Mexico community. "Here's this man who I'd just seen speaking on the floor of the Senate just as comfortable playing cards in this little house, " he said. But with a few exceptions like Apodaca and Mondragon, it appears the old guard Hispanic Democratic establishment is backing Clinton. Clinton carried the Hispanic vote in the recent Nevada caucus by a 2-to-1 ratio. In his Santa Fe speech, Kennedy openly appealed to Hispanic voters. He noted 70,000 Hispanic military members have served in Iraq and Afghanistan. In an interview after the speech, he spoke of the immigration issue, saying that during the national immigrant protests of 2006, the only U.S. senators to attend were Obama and himself. "That was a courageous decision for Barack, " he said. "Just like it was a courageous decision for him to speak out against the Iraq war from the beginning." Undocumented immigrants, he said, have qualities Americans admire -- hard work and devotion to family. But he said the immigration debate in the Senate last year "bordered on racism." Asked about Clinton's seeming to have more Hispanic support, Kennedy said in Obama's home state of Illinois, he won 75 percent of the Hispanic vote. "When people get to know him, they trust and support him, " he said. But he admitted in the New Mexico contest -- which in reality got under way just this month, after Gov. 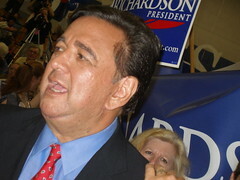 Bill Richardson dropped out of the race -- voters haven't had a lot of time to get to know Obama before Tuesday's caucus. Kennedy said he had not been in contact with New Mexico Hispanic leaders on Obama's behalf. When told former Rio Arriba political boss Emilio Naranjo -- a longtime Kennedy supporter -- is backing Clinton for president, Kennedy grinned. "In 1960, when I was here campaigning for my brother (John F. Kennedy), Emilio was backing Lyndon Johnson. But I've been back time and time again, and Emilio always treats me well." Earlier in the day, Kennedy spoke at the National Hispanic Cultural Center in Albuquerque. Although there have been no public polls of New Mexico Democrats in recent months, Lonna Atkeson, a University of New Mexico political science professor, said Wednesday that it makes sense that Hispanics would tend to support Clinton rather than Obama. She said a study she did of 2004 Democratic caucus-goers in the state showed Hispanics tended to identify themselves more as party members and tended to be more conservative than non-Hispanic caucus-goers. "Hillary Clinton early on was identified as the favorite of the party establishment, " Atkeson said. "And she's seen as more conservative than Obama. So it makes sense that Hispanics would tend to support her." Former state Sen. Fabian Chavez of Santa Fe is a longtime Kennedy admirer, but he's supporting Clinton. He said Wednesday that he believes Clinton has the best experience for the job. But there's another reason older Hispanics might be backing Clinton more than Obama. "It's his youth, " said Chavez, 83. He said he was talking with a friend at the Capitol on Thursday about the presidential race. "He said, 'I like Obama, but when I see his picture, I see a kid.' "
This one will be an Aug. 31 debate in Albuquerque hosted by the conservative Rio Grande Foundation. It's not just a conservative pep rally though. Carter Bundy of the American Federation of State, County and Municipal Employees will be there to represent the progressive side. He'll ne debating Michael Cannon, who is director of Health Policy Studies for the libertarian CATO Institute. Cannon favors a "free-market" approach to health-care reform. The debate is scheduled to begin at 6 p.m. next Monday at the Albuquerque Museum, 2000 Mountain Road NW in Old Town. Rio Grande Foundation director promises “a respectful and fair forum." That might be a hint to leave your guns at home. Cost of the event is $10 payable by cash or check at the door. Light snacks and beverages will be available. Space is limited and this is sure to be a popular event given the pressing nature of the topic, so let us know you’re coming by emailing us at: rsvp@riograndefoundation.org. Cannon has recently been in heavy rotation as a guest on television and radio talk shows and he has worked closely with Rep. John Shadegg (R-AZ) on free market health care legislation that would weaken the grip health insurance companies have over customers in particular states. Bundy has written and spoken extensively on health care issues on a variety of New Mexico media outlets, most prominently at the New Mexico Independent. Labels: "health care", "Rio Grande Foundation"
It's not our beautiful sunsets. It's not our tasty green chile or tri-cultural way of life. The Wall Street Journal weighs in on the Rebecca Vigil-Giron indictments. The indictments are the latest blow to New Mexico's Democratic party. Gov. Bill Richardson remains under federal investigation for allegedly steering state contracts to a financial-services firm in exchange for political donations. Mr. Richardson, who isn't seeking re-election, has denied any wrongdoing. Other Democratic public officials indicted or convicted in the state in recent years include two state treasurers; the longtime leader of the state senate; a director of affordable housing; and two members of the agency that regulates utilities. Many were accused or convicted of mishandling public funds. Nothing new really, at least for those of us who follow state politics. Just another blow to our national repuation. The entire story is HERE. No, I'm not going, but Gov. Bill Richardson is. Between this and the North Korean visit last week, the governor sure is getting international lately. The press release doesn't say whether he'll be visiting Fidel Castro to discuss baseball like the old days. Gov. Bill Richardson is traveling to Havana, Cuba, today as part of a trade mission designed to capitalize on potential agricultural and cultural partnerships between Cuba and New Mexico. The delegation will market New Mexico agricultural products and plant the seeds for possible cultural exchanges in the future. The mission’s primary objective will be to promote the sale of New Mexico agricultural products. Under a provision of the US Treasury Department Foreign Assets Control (OFAC), states are authorized to sell agricultural, medical and IT products in Cuba on a cash basis. Since 2000, a total of 42 other states have participated in similar trade missions to Cuba with total sales of more than $3 billion. The mission will include meetings with officials from Alimport, which is the Cuban Government agency responsible for agricultural commerce. Accompanying Gov. Richardson to Cuba will be state Agriculture Department Secretary Miley Gonzalez, Cultural Affairs Secretary Stuart Ashman, Katherine Miller, Secretary of the Department of Finance and Administration, and Gilbert Gallegos, the Governor’s Deputy Chief of Staff. Gov. Richardson is paying for all of his own expenses during the trip. The delegation will return to New Mexico on Friday. This will be New Mexico’s third mission to Cuba to promote its agricultural goods. The first took place in 2007 and was led by then-Congressman Tom Udall; the second in 2008 led by Cultural Affairs Secretary Ashman. The Art Museum at the National Hispanic Cultural Center is bringing a major exhibition on contemporary Cuban art to New Mexico. Confluencias Inside: Arte Cubano Contemporáneo provides an exciting overview of what is happening now with significant Cuban artists and various media. The exhibition, which opens at the NHCC on September 13 and runs through May 16, 2010, includes approximately 100 works by 40 artists working inside Cuba. Rael Announces For Lt. Gov. Lawrence Rael has become the latest Democrat to make it official. 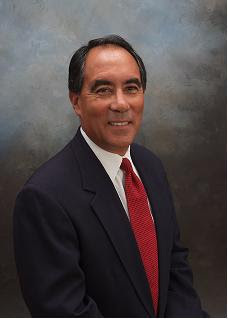 Lawrence Rael, Executive Director of the Mid-Region Council of Governments (MRCOG), today announced his candidacy for the office of Lieutenant Governor for the State of New Mexico. Rael has devoted more than 25 years in public service to building a better New Mexico. He served as the Deputy Secretary of Transportation under former New Mexico Governor Toney Anaya and as an Aide to Senator Jeff Bingaman. Other highlights in Rael’s long record of public service include serving as Chief Administrative Officer for the City of Albuquerque through three successive mayoral terms. He currently serves as Executive Director of the Mid-Region Council of Governments, a multi-county organization that assists in a variety of planning services ranging from transportation and land-use to workforce and economic development. More recently as Executive Director of the MRCOG, Rael was the driving force behind the New Mexico RailRunner Express. The New Mexico Rail Runner Express has become the fastest start-up of a commuter rail project in the country in the last 20 years. The project required working with more than 19 tribal and county governments, and creating partnerships necessary for the New Mexico Rail Runner Express’ successful completion. The Rail Runner demonstrates Rael’s ability to build consensus while respecting the diverse cultures of New Mexico. Rael joins announced candidates Santa Fe Sheriff Greg Solano, state Sens. Linda Lopez and Jerry Ortiz y Pino and all-but-announced candidate Brian Colon and possible candidates Espanola Mayor Joe Maestas and political newcomer Matthew Padilla. UPDATE: I knew I was forgetting someone. State Rep. and Santa Rosa Mayor Joe Campos also is running. That's what lawyers in the Rebecca Vigil-Giron case say about New Mexico Attorney General Gary King. They say he shouldn't be the prosecutor on the case, partly because one the defendants, Daisy Kupfer, use to work in the Attorney General's Office. A motion outlining that and other alleged conflicts of interest will be filed in the near future, a couple of the lawyers told me yesterday. My story about that in today's New Mexican is HERE. Labels: "Gary King", "Rebecca Vigil-Giron"
The New Mexico Independent was the first to report that contrary to initial news reports, two defendents in the Rebecca Vigil-Giron case, Joe and Daisy Kupfer, no longer are contracted to lobby for the city of Albuquerque. Mayor Marty Chavez's spokeswoman Deborah James says their contract expired in June and the decision to to renew it came in December and had nothing to do with the investigation. The reason so many of us reported that they were still lobbying for Albuquerque is because that's the information that's on the Secretary of State's Web site. It makes you wonder just how accurate the information is on that site. And my Capitol Bureau partner Kate Nash found a worse example. Ricardo Barros is listed there representing several clients. Only trouble is, Ricardo died several months ago. Betty Sparrow Doris might be leaving the Workforce Solutions Department, but not Rebecca Vigil-Giron. The New Mexico Department of Workforce Solutions was troubled to learn about the recent criminal indictment filed against one of our employees, Rebecca Vigil-Giron. Deputy Secretary Ken Ortiz noted that while “The allegations contained in the indictments are serious, they concern actions that are unrelated to her work with the Department.” Ms. Vigil-Giron currently is employed by the Department as a constituent liaison for the Labor and Industrial Division. As with other internal personnel matters, the Department will make no additional statements until it has had an opportunity to review the matter. Until that time, Ms. Vigil-Giron is expected to continue to fulfill her work duties. The Department requests that any questions regarding the substance or nature of the indictment be addressed to Ms. Vigil-Giron outside of her normal work hours or be addressed to her attorney. Workforce Solutions Secretary Betty Sparrow Doris is leaving her job, the governor's office just announced. According to the official statement, she's quitting "to spend more time with her family." Haven't heard that one in awhile, but spending time with your family is a good thing. And it turns out, her family is in Colorado. SANTA FE – Governor Bill Richardson today announced that Department of Workforce Solutions Secretary Betty Sparrow Doris is leaving her position to spend more time with her family. Gov. Richardson also announced that has appointed Ken Ortiz to serve as the new Cabinet Secretary for the Department of Workforce Department. Ortiz, who has served as Deputy Secretary of Workforce Solutions since May, was the Director of the Motor Vehicle Division for four years. He was at the Taxation & Revenue Department for nine years. 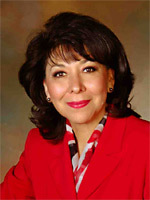 Ortiz takes over at the Department of Workforce Solutions on Aug. 31. Say what you will about Gov. Bill Richardson’s run for president back in 2007. He came up with some funny lines. And some of them were intentional. I couldn’t help but think about this Wednesday afternoon after getting an e-mail from the Governor’s Office concerning those discussions Richardson just had with two North Korean diplomats at the governor’s mansion in Santa Fe. “We had productive talks,” Richardson said in the statement. Productive for Richardson? Around the world, pundits are wondering whether this return to “Green Chile Diplomacy” is a significant sign that relations between North Korea and the U.S. are about to thaw. Here in New Mexico, pundits are wondering whether the meeting is an omen — an extremely good omen — for Bill Richardson. The U.S. Justice Department since last year has been investigating the Richardson administration’s dealings with a California company that was hired to handle some state investments and whether that contract is connected with large contributions to Richardson political committees. That investigation derailed the governor’s appointment as President Barack Obama’s commerce secretary. So does the North Koreans’ visit mean the danger of pay-to-play criminal charges has passed? Not necessarily, said a former U.S. attorney for New Mexico. Kelly, now in private practice in Albuquerque, said there would be extensive communication between a U.S. Attorney’s Office and “Main Justice” about such a matter. But, he said, it would be “highly unusual” for the Justice Department to be communicating with the State Department concerning an investigation. So apparently, we won’t know until we know. Former Secretary of State, former Congressional candidate, former Film Museum director appointee has been indicted on 50 felony counts including money laundering, fraud or embezzlement, creating false documents, tax evasion tampering with evidence, conspiracy etc. It's all connected with the $6.3 million paid to political consultant Armando Gutierrez in 2004 to produce public service spots for that election. Gutierrez, according to federal and state audits, could only account for $2.6 million of those payments. Gutierrez also was indicted as were lobbyists Joe and Elizabeth Kupfer. Each was indicted on 50 counts. I think that could be described as having the book thrown at you. Vigil-Giron on Wednesday said in a statement she could account for "every nickel" and claimed to be the subject of a "witch hunt." The Associated Press is reporting that North Korean diplomats will be meeting with Gov. Bill Richardson at the governor's mansion today. As North Korea made public statements about a possible “Third World War” and world attention turned to an escalating crisis over nuclear weapons in that country, two North Korean diplomats in Santa Fe on Friday had green chile and scrambled eggs for breakfast and red-chile enchiladas at The Shed for lunch. And as his two guests took in some downtown sightseeing during a four-hour afternoon break from closed-door discussions, Richardson took time out of his unexpected role as international go-between to interview candidates for a vacant judge’s seat in Farmington. The North Koreans visited the Plaza, St. Francis Cathedral and The Palace of the Governors, guided by a local tour operator. Though the talks initially were scheduled to last two days, Richardson said that after a “working dinner” on Friday evening — they dined on trout — a final session is planned this morning. The governor has repeatedly stressed that he’s not an official envoy of the Bush administration. This visit comes only weeks after former President Bill Clinton went to North Korea to negotiate the release of two American journalists imprisoned there -- a mission for which Richardson's name had been discussed. It also comes as South Korea is preparing for its first rocket launch, which the AP described as "a landmark launch that could boost the country's ambitions in space but risked the wrath of rival North Korea." For more details catch Wednesday's New Mexican. I attended and wrote about the health-care forum with U.S. Rep. Ben Ray Lujan at Santa Fe's Unitarian Universalist church Monday night. My story is HERE. As stated in the story, the majority of the crowd, judging by applause, etc., was strongly pro-reform. Organizers of the event didn't take any chances though. Participants didn't get to directly question Lujan or the other panelists. Instead, they wrote out their questions in advance to be read by a moderator. I had predicted earlier in the day that there would be a lot of emotion and anger there. Not from conservatives, but from progressives upset about President Obama's statement Saturday that the public option for health insurance was only a "sliver" of health-care reform. There were some questions to the effect of "how can we hold down insurance prices without a public option?" But Lujan basically agreed that the public option provision is important and necessary, so it wouldn't have served any purpose to yell at him about that. Lujan might wish that he had not urged people to consult with non-biased fact-checking Web sites. He quoted the Congressional Budget Office that the House health care bill would create a $6 billion surplus. You can see what Polifact.com says about that HERE. Here's a story I did last week about a health-care roundtable led at the Roundhouse by U.S. Sen. Jeff Bingaman. that was even more sedate. Labels: "Ben Ray Lujan", "health care"
Poring over transcripts of Karl Rove’s House Judiciary Committee testimony about his role in the firing of U.S. Attorney David Iglesias, I came across lots of names familiar in New Mexico political circles. But I nearly fell out of my chair when I saw who Rove name-dropped on page 120 of his July 7 testimony: Someone who shares my cubicle at The New Mexican’s Capitol bureau. This week’s release of transcripts, e-mails and other documents show that Rove, President Bush’s political adviser and a former deputy chief of staff, was more involved with the firing of Iglesias and other U.S. attorneys than originally known. 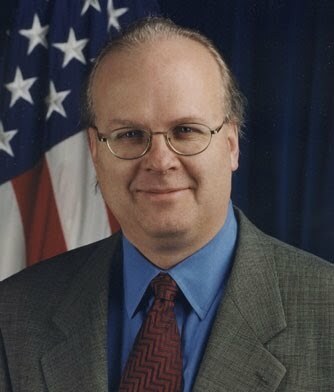 Rove was questioned by Rep. Adam Schiff, D-Calif., about an Oct. 2, 2006, article in the late lamented Albuquerque Tribune. The premise of the story was that now that the trial of former state Treasurer Robert Vigil was over, the next big corruption case involving a New Mexico Democrat would be a kickback scandal involving state Sen. Manny Aragon, the Albuquerque Democrat. Apparently former Republican National Committeeman Mickey Barnett -- who had been pushing to get rid of Igelesias -- had sent the story to Rove. Don’t feel bad Karl. I asked Kate, who works for this paper now, but she won’t tell me who her sources were, either. Ripples in the governor’s race: The names of one probable Republican gubernatorial contender — former state Republican Chairman Allen Weh — and one possible governor candidate — former U.S. Rep. Heather Wilson — were discussed in the Rove testimony. So you can bet Democratic opposition-research sharks have been burning their eyeballs going through the thousands of pages of documents released by the Judiciary Committee this week. Iglesias has said he was fired as U.S. attorney for New Mexico partly because he didn’t indict Aragon in time to help with Wilson’s 2006 re-election. Among the documents released was an October 2006 e-mail chain. Wilson, then facing Democrat Patricia Madrid in a close election battle, sent an e-mail to her staff and U.S. Sen. Pete Domenici’s chief of staff, Steve Bell. Wilson said the news story concerned her because of a possible FBI leak. “I believed it was possible we would see a similar leak from law enforcement concerning Mrs. Madrid and that we could be asked by the media to comment on it,” she said. Apparently nothing ever became of that investigation. Madrid was never charged with any wrongdoing. Justice for America is still a registered PAC, headed by Madrid’s husband, Michael Messina. According to its most recent report in May, it had more than $415,000 in the bank. A welcome endorsement? I can envision an attack ad springing out the following exchange during Rove’s testimony. Rep. Schiff read from an e-mail from Weh to Rove aide Jennings in which Weh complained about Iglesias. Schiff then asked Rove about Weh. “Is he a friend of yours?” Schiff asked. “He is a good friend of mine,” Rove said. Newly released e-mails and transcripts of testimony by former White House political director Karl Rove and former George W. Bush counsel Harriet Miers seem to indicate what some critics have long claimed might be true: that former U.S. Attorney David Iglesias was canned because he wasn't doing enough to help former U.S. Rep. Heather Wilson in her 2006 re-election against Patricia Madrid. "... why should the US Attorney in New Mexico be shy about doing his job on [Patricia] Madrid," said Rove assistant Scott Jennings in an e-mail to his boss. According to e-mails and interviews with people familiar with the investigation, GOP figures in New Mexico believed that if Iglesias pursued public corruption cases against Democrats, it could have helped Wilson in her run for reelection. 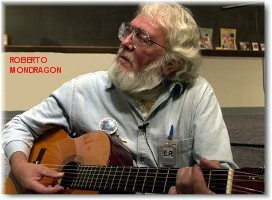 A mid-October 2006 e-mail chain that started with Wilson indirectly criticized Iglesias for not bringing public corruption prosecutions in the run up to the midterm elections. Wilson attached ... a news report about an FBI investigation of Rep. Curt Weldon (R-Pa.) in that state as a point of contrast. The same day, Steve Bell, chief of staff to then- Sen. Pete Domenici, e-mailed Rove's deputy Scott Jennings to say that it "seems like other U.S. attorneys can do their work even in election season. . . . And the FBI has already admitted they have turned over their evidence to the USA in NM and are merely awaiting his action." Jennings forwarded the messages to Rove, saying "Steve Bell sent this email . . . essentially saying that the U.S. Attorney in PA has no trouble going after Weldon, so why should the US Attorney in New Mexico be shy about doing his job on [Patricia] Madrid." 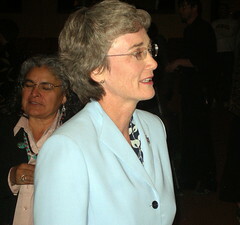 Madrid was Wilson's Democratic opponent in the 2006 congressional race. "My e-mail is only one sentence long and does not relate in any way" to Iglesias, Wilson said. "In early 2006, we made a strategic decision to campaign on national security and competence," not public corruption. I welcome the release of my House Judiciary Committee interviews and accompanying documents. They show politics played no role in the Bush Administration’s removal of U.S. Attorneys, that I never sought to influence the conduct of any prosecution, and that I played no role in deciding which US attorneys were retained and which replaced. UPDATE: (8-13-09) Former Rep. Wilson e-mailed me saying her quote, noted above, in The Washington Post should have said "In early October 2006 we made a strategic decision ..."
Supposedly it's going to be a one-day session. That would be nice. Gov. Bill Richardson, during a meeting today with a bipartisan group of legislative leaders in the House and Senate, agreed to call a Special Session of the Legislature, probably in October. The special session, which the Governor and legislators want to limit to one day, will only deal with anticipated budget shortfalls that are a direct result of the national recession. The Governor will not consider any other legislation for the session agenda. The governor and legislative leaders also agreed to form a legislative-executive working group to negotiate a bipartisan agreement on the budget before a special session is convened. “We are fortunate that New Mexico – with healthy cash reserves – is in much better shape than most states, which have resorted to laying off state employees and drastically cutting services,” Governor Bill Richardson said. “But we are definitely facing tough challenges, and we must continue to make sacrifices to balance the budget. “Because our budget deficit is directly related to the national recession, I want to make sure that we don’t take any action that might cost jobs or adversely affect the state economy,” Governor Richardson said. Gov. Richardson told legislators that he wants keep the 2003 tax cuts (personal income, corporate income and capital gains) intact so we don’t hurt efforts to recruit new business. Gov. Richardson and legislative leaders are waiting for final consensus revenue estimates that will show a substantial revenue shortfall. The Governor and legislators agreed that a special session is necessary to take immediate action to balance the budget. Did I miss a big development in the last few days? Enthusiasts include former New Mexico Governor Bill Richardson and legendary designer Manuel. I was pretty sure he was still governor when I left the Roundhouse last night. But I'd probably double check. An Albuquerque man who opposes health-care reform caused a stir today when with his Twitter tweets he seemingly advocated violence at town hall meetings. However, Scott Oskay, in a telephone interview this evening, admitted he went overboard with his tweets and does not really want to see violence. Oskay, who says he's a 40-year-old single parent, posted on Twitter several messages. 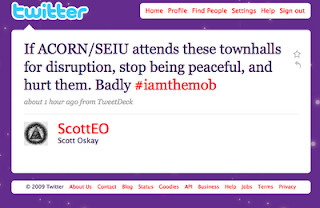 One said, "If ACORN/SEIU attends these townhalls for disruption, stop being peaceful, and hurt them. Badly." Another read, "If ACORN/SEIU attends these meetings for disruptive purposes, and you have a license to carry....carry." "I go on free association rants on Twitter," Oskay said. He said was trying to parody the pro health-care advocates' caricature of anti health-care activists. Some of his other tweets this afternoon hint at this. "Recommendation to the left: Be careful of what you hallucinate. It might become real." "If you use typical GOP-insult stereotypes on ALL folks that simply oppose obamacare, I'm going to call you out for your stupidity/bigotry." Oskay has since deleted the "hurt them" tweet. But not before it was picked up on the Talking Points Memo blog, which posted a screen capture. "Democrats strongly believe there is nothing wrong with an honest debate about how we should reform our broken health care system. These remarks from Mr. Oskay, along with actions such as holding Nazi signs at events, hanging effigies of members of Congress and faux tombstones of others that we have seen at town halls all across America are appalling and must stop. Geise called on Republican leaders like state Chairman Harvey Yates and Congressional candidate Steve Pearce to denounce Oskay's "threats" and other "violent aggressive actions by a minority of "mob" protesters." 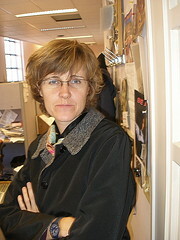 Oskay in the interview insisted he is not advocating health-care opponents instigate any type of violence at public meetings. But, he said, if opponents are attacked verbally or physically by the other side, they should respond in kind. He says he's not a Republican. "I've been a registered Republican and a registered Democrat," he said. "I'm probably more of a libertarian, but I'm not a member of the Libertarian Party. They probably wouldn't want me after this." Oskay said he's got liberal friends and conservative friends -- and frequently offends both with some of his "rants." Another One For Lt. Guv. It's been more than 24 hours since I posted anything about another Democrat contemplating a run for lieutenant governor. Some of you are getting antsy in anticipation, I know. Carol Clark of the Los Alamos Monitor just pointed out that she uncovered one a couple of weeks ago: Espanola Mayor Joe Maestas. Maestas ran in the Democratic primary for Public Regulation Commission last year but came in third in a contest won by Jerome Block, Jr. Here's a link to Carol's story. A little follow-up to my column yesterday. Former Santa Fe County Commissioner Javier Gonzales’ road to becoming state Democratic Party chairman got easier Thursday after the only other active candidate for the post dropped out and endorsed Gonzales for the unpaid job. 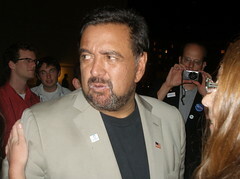 David Montoya, chairman of the Sandoval Country Democrats, said in a phone interview, “I really like Javier. I like his family. And I believe it’s important that we get together and work for Lt. Gov. Diane Denish to become governor. After Montoya agreed to drop out of the chairman’s race, current chairman Brian Colon appointed him to a newly created position of senior adviser to the chairman and director of party strategy. The chairman’s position will become open Saturday because Colon is resigning to prepare for a campaign for lieutenant governor. Gonzales, who works as a business consultant and serves on the Board of Regents for New Mexico State University, said earlier this week he intended to begin campaigning for the chairman’s post shortly after Colón steps down. Labels: "Javier Gonzales", "NM Dems"
Roundhouse Roundup: Colon Stepping Down, or Is He Stepping Up? Brian Colón will step down as state Democratic Party chairman at the end of the week, moving closer to a bid for lieutenant governor. "I am submitting my resignation to the Party on Friday and it will be effective on Saturday," Colón told me in an e-mail on Wednesday. "I will then consider my bid for Lt. Gov." 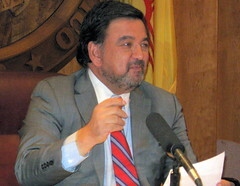 Colón, an Albuquerque lawyer closely allied with Gov. Bill Richardson and Lt. Gov. 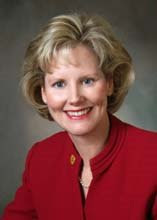 Diane Denish — the only declared 2010 Democratic gubernatorial candidate — has been chairman since April 2007. The party's Central Committee will choose another chairman. State party executive director Josh Geiss said the party is shooting for early September for that meeting. Both Javier Gonzales, a former Santa Fe County commissioner, and Sandoval County Democratic Party chairman David Montoya have shown interest in the job, Geiss said. 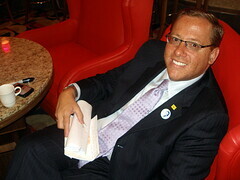 "Yes, I'm definitely preparing to enter the race for state chairman," Gonzales told me Wednesday. Gonzales, who works as a business consultant and serves on the Board of Regents for New Mexico State University, said he'll start actively campaigning for the unpaid post shortly after Colón steps down. 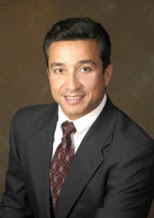 Gonzales, the son of former Santa Fe Mayor George Gonzales, served on the County Commission between 1993 and 2002. He's often considered running for other offices, including Congress, Santa Fe mayor and — apparently like most New Mexico Democrats with a pulse — lieutenant governor. Speaking of which: The list of active and probable Democratic lieutenant governor candidates keeps growing. State Rep. Joe Campos of Santa Rosa said Wednesday that he's adding his name to that list. 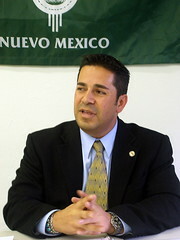 Campos is in his fourth term as a legislator and has been mayor of Santa Rosa for 12 years. He also served a term as a Guadalupe County commissioner. 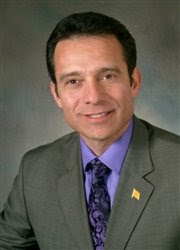 Announced candidates for lieutenant governor include Santa Fe County Sheriff Greg Solano and state Sens. Jerry Ortiz y Pino and Linda Lopez, both from Albuquerque. Mid-Region Council of Governments Executive Director Lawrence Rael is considering the race, as is political newcomer Matthew Padilla, a former aide to U.S. Sen. Jeff Bingaman. Meanwhile, on the GOP side: State Rep. Janice Arnold-Jones of Albuquerque is telling reporters she'll seek the Republican nomination for governor next year. Arnold-Jones, first elected to her House seat in 2002, is expected to formally announce this month. Arnold-Jones is best known for webcasting House committee meetings without waiting for formal permission from House Speaker Ben Luján. It's not known whether her announcement will stream live over the Internet. Other GOP candidates for governor include Doña Ana County District Attorney Susana Martinez and former state party chairman Allen Weh. Former U.S. Rep. Heather Wilson has said she's considering a run, as has former Gary Johnson campaign manager Doug Turner. I would hope that this high-school diploma includes mastering the correct use of the apostrophe. I don't claim to speak perfect English — my exact language is some unclassifiable Okie dialect strongly influenced by early '60s rock 'n' roll deejays — and I've made my share of typos. But the incorrect "apostrophe S" is one that drives me crazy, probably because it's so common. Some might even suggest that this error actually might help spotlight the educational crisis in this state. So I hope all you educator's and state public information officer's get to work on that. Several weeks ago the idea of sending Gov. Bill Richardson or former vice President Al Gore to North Korea to negotiate the release of two American journalists, Laura Ling and Euna Lee, had been mentioned as a possibility. Richardson, for those who haven't followed his career, has secured the release of other Americans held in North Korea and has traveled there several times. "Bill Clinton going to N Korea to negotiate release of 2 journalists, proving Hillary is still pissed at Bill Richardson." I don't know whether this literally is a sign that the secretary of state is still angry that Richardson endorsed Barrack Obama last year instead of her or whether it's a reflection of the governor's diminished clout due to the grand jury investigations. Most likely it has something to do with the fact that a former president might be better able to get things done. One difference between Clinton and Richardson is that the former president got to meet with Kim Jong Il himself. Correct me if I'm wrong, but it seems that when Richardson has gone over there, he didn't get an audience with the Dear Leader. U.S. District Judge Judith Herrera has sided with the Center for Civic Policy, New Mexico Youth Organized and the Southwest Organizing Project,in a lawsuit against the state Attorney General and the Secretary of State. The dispute goes back to before the 2008 primary election when the non-profits sent out mailers critical of several state lawmakers, who, the mailers said, side with special interests over their constituents. Some of those legislators were facing primary opposition, and some of those -- namely Sens. Shannon Robinson and James Taylor and Rep. Dan Silva, all Albuquerque Democrats -- lost their primaries. Robinson was especially vocal in accusing the CCP and NMYO of being "political committees." In a lengthy and rambling speech on the Senate floor during last year's special session, he called the mailers "obscene material" and said, "It's not educational; it's designed to create hatred." Attorney General Gary King agreed that the mailers were political and ruled the groups should register as PACS and reveal their contributors. The organizations argued they were engaged in an "educational" campaign and never advocated voting for or against any candidate. Judge Herrera, in a 30-page ruling, agreed with the non-profits. CCP policy director Matt Brix issued a statement saying, "Judge Herrera looked at the facts of the case in light of the law. This ruling represents one more victory for the nonprofit sector in New Mexico in its battle to defend the First Amendment and fulfill its mission of educating the public about how the legislative process works and how legislators vote." Another lawsuit, filed by Robinson, Taylor and Silva against the non-profits, was thrown out of state court late last year. "We are disappointed in the outcome of today's ruling and we will take some time to thoroughly review the court's decision before deciding our next course of action. We are assessing our options and will likely make that public in a few days." Finally here's a Democrat who's NOT running for Lieutenant. Governor. 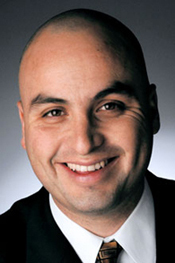 State Auditor Hector Balderas announced this morning he's seeking re-election. "Seven years ago, I entered public service as a young prosecutor with the goal to make a positive difference in the lives of others. Taking a path which began in a small office cubicle to now serving as your State Auditor has been a remarkable journey. I have chosen to take a stand and fight against public corruption, conflicts of interest, and unaccountable governments and officials. Additionally, I have partnered with citizens statewide to gather anonymous tips to strengthen oversight through my fraud hotline. With just 30 brave employees and one of the smallest budgets in the state, we have created an expectation and a reality that New Mexico will have an independent voice to speak on behalf of taxpayers and on the real conditions of our government. There is much more important work to be done. For these reasons, I have chosen to continue on this path and seek a second term as your State Auditor."